We often equate people to animals, when we think of the character traits and behaviour they display. Upon meeting someone for the first time, we sometimes think he or she’s a bit like a weasel, a stoat, an otter or badger…and in some extreme cases the word skunk springs to mind! What all of the above animals have in common is that they belong to the family of mustelids. The lovely young Polish lady, who has joined my German language group on Tuesday evenings, prompted me to think more about mustelids (in a good way!) and I shall devote several blogs to describe the members of this misunderstood, hunted and reviled family of splendid animals. While many mustelids are being (ab-)used to describe negative qualities in humans, the otter stands for everything that’s good about a person and frankly, everything that makes life worth living! Just as the young Polish lady believes a positive attitude will help us achieve whatever we set our hearts on in life, the otter stands for the sheer joy of living, the exuberance and agility of youth, the happiness simple pleasures in life can bring to those who look for beauty in all things. There are 65 different species in the family of mustelids, all of which are carnivores. With the exception of Australia, some small islands and Antarctica, mustelids occupy diverse habitats across the globe. I’m not sure how otters will fit into Willow the Vampire’s next adventure, but I’m determined to have one of my favourite animals crop up at regular intervals in Willow’s second instalment! Mustelids can live in tundras, deserts, forests, fresh and salt water; they can be arboreal, burrowing, terrestrial, semiaquatic and even fully aquatic. Most mustelids are quite small or medium sized, weighing just a few pounds, but wolverines and sea otters can weigh up to 25 kg (55 pounds) and are the largest members of the mustelid family. While most of them live solitary lives, coming together only when mating time approaches, some mustelids like badgers and giant river otters for example, live in large family groups. Otters are playful creatures, charming and quite mysterious. Not all mustelids are strictly nocturnal, some hunt at night, some at dusk and others come out at dawn. While all otters have dextrous paws, some otters have more webbing than others and some have claws and others don’t. Most river otters, which includes the European otter, have webbed paws for swimming and long claws for digging, which are rounded, so they can walk comfortably on land. Sea otters often use stones to crack open shells of sea urchins, crabs and shellfish. They even have a special pouch or skin fold under their armpit to keep hold of their favourite flat stone, while they are swimming. Giant river otters live along the riverbanks of slow-moving, sluggish water, or in marshes, swamps, wetlands and forests of South America, where these otters use their superb swimming skills, large feet and highly developed webbing between their toes to catch fish. All otters love to play and, just like kids love to slide in the mud, snow or on ice, otters use their forepaw and tail power to slither down slimy riverbanks, snow-covered slopes or muddy, leaf-mulch covered embankments. They can tuck in their legs to reach maximum speed during sliding and they adore landing with a belly flop in the river or other water at the bottom of a slope. Some otters even play tag and indulge in mock fights to pass the time. Inquisitive, intelligent and fun-seeking, otters are gradually making a come-back to European landscapes, after having been hunted almost to extinction and driven out of their natural habitats by Earth’s most evil villains, humans. Otters are natural fishermen, something that has over the centuries brought them into conflict with humans, who believe everything on this planet belongs to them. 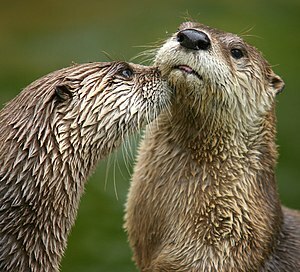 Otters love to hunt eels, snakes, crayfish and various species of fish. 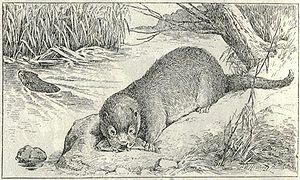 Since their fur is rather luxurious with a long-haired outer layer and a thick undercoat to protect them from the cold when in water, otters were often hunted for their fur, so that stupid, vain mend and women could wear them as a collar around their scrawny, perfumed necks. Whatever other writers might do with the vampire genre in the future, my toothy little heroine will never be adverse to biting insurance salesmen and estate agents or eating bankers and politicians (the latter are best served when marinated first in red wine and herbs, then BBQ-ed over a small flame; they tend to taste a little bitter and the acid in the wine helps to take the sliminess off). Animals will find a powerful protector in Willow and her vampy family… so watch out, Earth’s most evil villains, Willow’s on the prowl! …this is why my post reads “the next few blog posts will be about mustalids”…I just started with otters, because they are my favourites…there’ll be enough ferrets, weasels, stoates, badgers, skunks, sables, pine martens and whatever else falls into the mustelid family to delight the most ardent fan. Can’t cram it all into one post, you know, wouldn’t do the little darlings any justice. Thanks for reading my blog. Hi Maggsx2, yes otters and all other mustelids are great creatures. I can’t being to describe my exitement and joy when some years ago I saw my first otters and pine martens in the wild. They are great fun to watch. 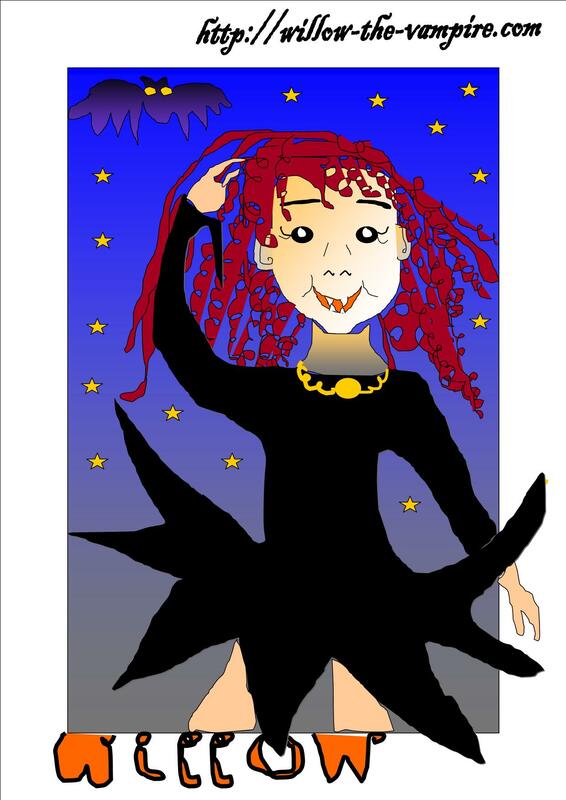 Willow is wearing a handkerchief dress, I used to wear those. Okay, back on subject – this is a lovely post on a lovely creature. I wish there were more of them in England. I have shared this post on Facebook, I like it so much. Perhaps, Willow could save an otter from a terrible fate? Thank you for the compliment and for passing this post on. Yes, I’m thinking of Willow assembling an army of friends, not just vampires, ghosts and the odd good human, but also animals, among them otters. I think that will work very well.